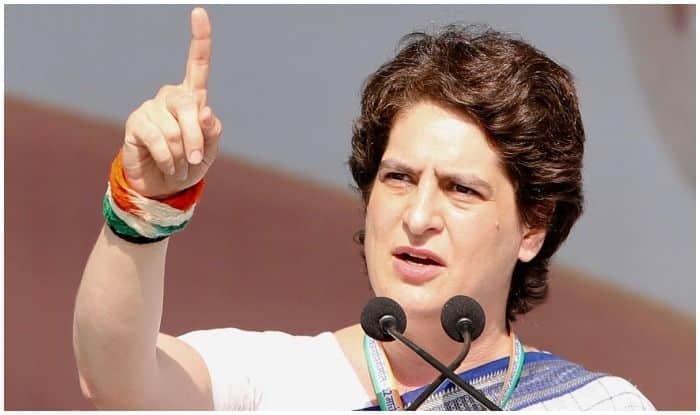 Priyanka Gandhi Vadra might contest the Lok Sabha elections 2019 against Prime Minister Narendra Modi from Varanasi. New Delhi: Congress’ general secretary for Uttar Pradesh (East) Priyanka Gandhi Vadra on Sunday slammed Bharatiya Janata Party’s (BJP) manifesto for Lok Sabha elections 2019, saying that there is no space for different cultures and religions in it. Earlier this month, Prime Minister Narendra Modi, BJP chief Amit Shah had released party’s 45-page manifesto titled “Sankalp Patra” for the national elections. Drafted on the theme of a ‘Sankalpit Bharat – Shashakt Bharat’ (determined India, empowered India), the ruling party’s ‘Sankalp Patra‘ makes 75 promises to woo different sections of the society, particularly farmers, youth and women, besides the oppressed. Meanwhile, holding a roadshow in Assam’s Silchar in support of Congress candidate and sitting MP Sushmita Dev, Priyanka also attacked Prime Minister Narendra Modi for ‘not getting time to visit his own parliamentary constituency Varanasi’. Gandhi claimed that she was told by people in Varanasi that PM Modi did not spend even five minutes with anyone there in the last five years. “He went to America and hugged there, went to China and hugged there, too. He went and hugged in Russia and Africa. He went to Japan and played the drum. In Pakistan, he had biriyani. But in his own constituency, he did not go once to a family’s house to enquire about their condition,” she alleged. In a veiled attack on ruling BJP, Priyanka also said that attempts are being made to destroy the Constitution. “It is ‘Mahapurush’ (B R) Ambedkar ji’s birth anniversary. He laid the foundation of this country through the Constitution. It is the duty of every leader to respect that Constitution. Today, you are seeing that the Constitution is not respected and an attempt is being made to destroy it,” said Gandhi. She also showered praise on Congress lawmaker Sushmita Dev and compared her with her grandmother and former PM Indira Gandhi. “If you remember Indira Gandhi even today, it is because she worked for you. I have come here for Sushmita. She has that courage which Indira ji had. Sushmita has that honest and good intention, and wants to work for you from the heart,” news agency PTI quoted Gandhi as saying. Earlier on Saturday, it was reported that the Congress general secretary for Uttar Pradesh East might be pitted against Prime Minister Narendra Modi in the Lok Sabha elections. Zee News sources had said that Priyanka is likely to contest elections from Varanasi Lok Sabha seat, which was won by PM Narendra Modi in 2014. According to reports, Priyanka has agreed to contest from the parliamentary constituency after serious considerations and the final decision will be taken by the party High Command now. Varanasi will go to polls on May 19. The counting of votes will take place on May 23.